November wasn’t a very perpetual month for this endeavoring PAL. My wife and I had our second child and we have been adjusting to life with two kids. So Acumatica took a backseat (as it should have). However, in this post I’d like to revisit the previous post on my experience with Acumatica on iPhone. Thanks to Gabriel for commenting on the post and setting me straight that indeed Acumatica does work on the iPhone. I tried using my iPhone to connect to the Acumatica Partner Portal which runs Acumatica of course and which I have access to thanks to ARCVAR. Just as Gabriel said, the Partner Portal works fine on my iPhone. So, of course the problem is not with my iPhone, but with my local laptop installation of Acumatica. At first I was tempted to try and figure out what was wrong with my laptop version of Acumatica. I concluded that it must have something to do with my installation of Microsoft Internet Information Services (IIS). 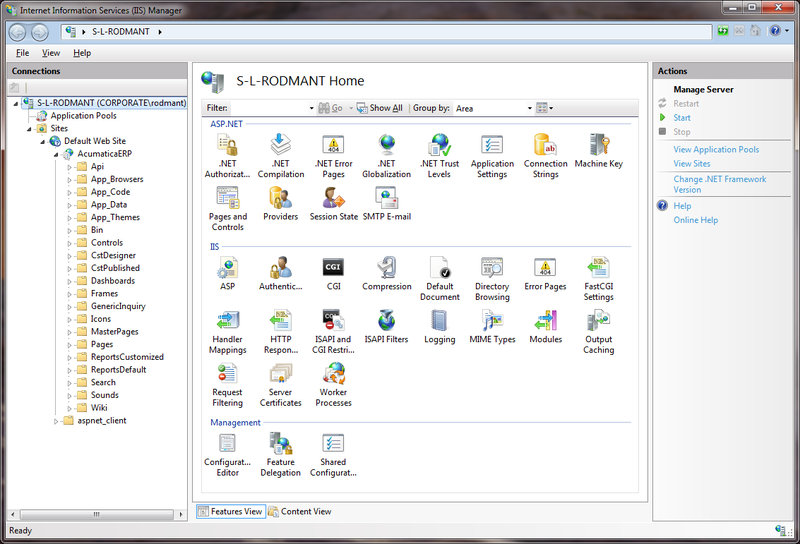 When I initially installed Acumatica, I didn’t do anything more with IIS other than to turn it on because I wanted to get things up and running as soon as possible. I do know that getting a web server like IIS configured correctly requires a good deal of expertise, especially when you start considering the need for strong security due to the fact that a web server is under constant attack. Since I have a local laptop installation of Acumatica that I don’t care to make available on the internet, I didn’t really care about securing my IIS. However, I didn’t consider that I would run into functionality problems with Acumatica due to my lack of IIS configuration. The first time I noticed a problem was when I tried to use the new Excel Connectivity feature in Acumatica 4.1. It didn’t work for me on my laptop Acumatica installation. I can’t remember the exact error, but it had something to do with me not configuring a public certificate for https (which I don’t really know how to do). My inability to use my laptop Acumatica installation on my iPhone is now the second time that I have run into a problem due to my lack of IIS configuration. And, I won’t be surprised if I run into more issues in the future. I stared at this for a few seconds and then it dawned on me, “this is why why people like SaaS!” This is a perfect concrete example of why SaaS makes sense. Of course, I could spend a few hours going through the different IIS configuration options and using Google to help me understand things. But, my wife and I just had our second child. I don’t have time for this. I want to get back to learning Acumatica. Someone already got Acumatica working on the iPhone as evidenced by the Acumatica Partner Portal. Why should I waste time reinventing the wheel? Now, of course, there comes a certain point when it makes sense for a company of large enough size to bring their Acumatica installation on premise and invest in people who know how to make it work properly. But, for a guy like me who just wants to learn the product or for a business who just wants to get up and running quickly, why not go with the SaaS option? So, needless to say, I won’t be spending anymore time on trying to get my laptop Acumatica installation to work with my iPhone. But, at least I know that it works and that’s good enough for me. Update 06/16/2015: Now, with TryAcumatica.com, I rarely use my local laptop installation of Acumatica.